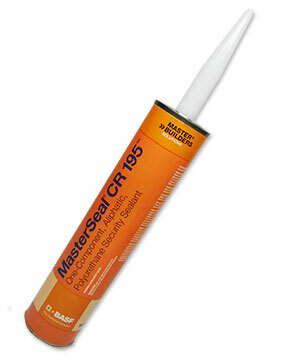 PRODUCT: MasterSeal CR 195 Sealant (formerly Sonolastic ULTRA). Security / Food Grade High Strength Sealant, Gun Grade Modified Polyurethane. WHITE Color, 300ML / 10.1 OZ. Tube. Price/Tube. APPLICATIONS: Sonolastic Ultra is a one-component, moisture-curing, aliphatic, non-sag, polyurethane sealant for uses requiring very strong yet elastic, high adhesion, shrink free, high moisture resistance, superior color integrity and enhanced long term UV resistance or in food processing applications. Excellent for sealing swimming pool deck-to-pool wall interfaces (above the water line). USDA compliant for meat and poultry areas. Shrink free, for security applications (prison windows, schools, public buildings), food service, and other areas needing a very tough tough product. Meets ASTM C920, Types S. Grade NS, Class 25. Uses NT,T,M,A, G and D.
Meets Federal Specification TT-S-00230C, Type II, Class A (with primed surface). Meets Corps of Engineers CRD-C-541, Type II, Class A.
Canadian approval for use in areas that handle food.